How happy is your radiology department? December 5, 2018 -- Some years ago, I had reason to ask the medical director of a hospital in the U.K. what the rest of the hospital thought of its radiology department. "We think of it," he replied after a short pause, "as a dark place where dark things happen." Leaving aside the literal truth of the fact that our work generally requires low levels of ambient lighting, do you know anyone else who starts a day's work by turning out the lights? A metaphorical darkness also can sometimes envelope radiology departments. The recent report of high levels of bullying is one illustration of what can happen when things go wrong. As our understanding increases of the importance of a healthy team culture to good outcomes in healthcare, it's probably a good idea for all of us to reflect from time to time on how things feel in our own departments. So how can we recognize a healthy culture when we see one? One of the fundamental components of a healthy culture is a general perception of fairness. This applies to both workload and remuneration. Regarding workload, this is not the same as asking whether everybody issues the same number of reports or carries out the same number of procedures. As humans, we tend to overvalue our own contributions to any collective enterprise, and correspondingly to undervalue the contributions of others. All of us suspect sometimes that we are doing more than our fair share, but that's exactly the point -- ALL of us feel that some of the time. A department of 10 radiologists, each of whom goes to work determined to do precisely 10% of the work will inevitably fail to deliver the workload overall, and it will not be a happy place. Every effective team requires at least some members to accept that they might be doing a little more than what is strictly their share, but they also recognize that the benefits in terms of professional satisfaction, a functional team, and good outcomes for patients more than compensate for the extra effort. As far as remuneration is concerned, this is highly specific to the context in which we are working. Historically in the U.K., for instance, much bitterness resulted from inequitable arrangements for private practice, with some radiologists feeling excluded from opportunities to enhance their income in this way. The advent of teleradiology and outsourcing has ameliorated this to a degree, giving all radiologists the chance to do extra work outside of their National Health Service (NHS) contracted hours, regardless of local private practice arrangements. After assessing whether at least a majority of members of the department feel that they are getting a fair deal in the workplace, the next fundamental indicator of a good culture is the level of mutual respect among team members. How often do the radiologists seek second opinions from each other? How often does each give and receive feedback on cases they have reported? Does everybody have their own niche in the department -- is there something, however small, for which everybody is the go-to person? It is a fact of life that none of us is indispensable, but at the same time in a good team no one is completely dispensable. Everyone would leave a gap of some sort if they were suddenly not there. This mutual respect should also be evident in the way in which the department handles errors and discrepancies -- the ability to hold frank and honest discussions when something has gone wrong and to learn lessons together without individuals feeling threatened or undermined is a very good marker of a healthy culture. Mutual respect does not have to mean the same as friendship. Plenty of evidence points to the fact that the most effective teams comprise a diverse range of individuals rather than necessarily a group of close friends. For that reason, it is probably a good sign if your department has a social dimension with events organized for all the team, but many excellent departments manage without. Every team needs leadership. How well-supported is the leader of your department? How keen are colleagues to take on a leadership role? An unwillingness to lead might reflect on the culture in the wider organization rather than the radiology department itself, but without a measure of support from colleagues, effective leadership becomes all but impossible. If you really want to know how your department feels, sometimes you'll have to ask for an independent view. Some of the best and most objective observers are your trainees, particularly if their training involves working in a number of different departments, and as long as their feedback is obtained through a mechanism that guarantees confidentiality and hence a "safe space" in which to be frank. And at the end of their training, these same individuals can vote with their feet -- how keen are they to apply to work in your department? Of course, there are many factors that will influence that decision, but if none of your former trainees want to come back, it's probably worth asking why not. In case anyone gets the wrong idea, I can assure you that my own department -- like all of yours I'm sure -- scores variably on the indicators I have proposed. The main message is that we ignore the culture of our departments at our peril -- it really pays to let a little light into the darkness. Dr. Giles Maskell is a radiologist in Truro, U.K. 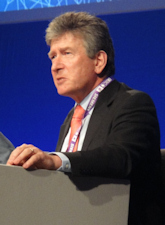 He is past president of the U.K. Royal College of Radiologists. Competing interests: None declared.